We use bonacure repair shampoo and conditioner, bonacure color seal shampoo and conditioner, bonacure moisture shampoo and conditioner. 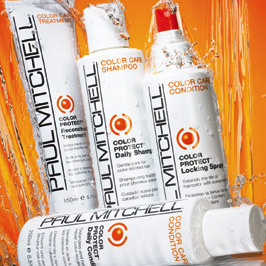 We use a variety of Paul Mitchell products including entire shampoo line and a variety of styling products. The Rusk products we use include Pure shampoo and conditioner, Calm shampoo and conditioner, Thick, being undressed, Sensories, Thermal STR8, W8less, etc.